Multifleet > Uncategorised > Fleet Managers: Shocking UK Driving Statistics – Does this apply to your fleet? Fleet Managers: Shocking UK Driving Statistics – Does this apply to your fleet? Is your Fleet Safe? Shocking Driving Statistics Revealed! In the UK we like to joke about bad driving, the white van man notorious for careless driving, women drivers who take a year to park – Ha ha its all very funny. Here’s some research about us drivers in the UK which perhaps isn’t so funny. Do any of these apply to your company fleet drivers? A massive 75% of us of don’t know how to check our oil. Research also found that drivers where unaware of the benefits of using the correct oil, and that it can actually prolong your engine’s life. The major concern is that if your oil runs out your engine could seize up and have to be rebuilt or replaced completely – leaving you with a rather hefty bill at the end of it all. 2. 1.3 million Drivers Don’t Know Whether or not They Carry a Spare tyre. Around 26% of us are unlucky enough to experience a puncture every year. It’s something we should all be prepared for, so how come 36% have the equipment but don’t know how to use it? 10% have the spare tyre, but not tools to fit it – useful 😉 and research by Kwik Fit revealed 1.3 million drivers do not know whether or not they carry a spare tyre. Although it is not illegal to drive without a spare tyre it is highly advisable to do so, as something as small as a pothole could cause a puncture, and we know how common they are these days! 3. Number of Young Drivers Checking Facebook and Twitter at the wheel has Increased by 50%. Using your phone whilst driving was made illegal in 2003, so you think we would all have got used to the idea by now. However it seems we’re just too sucked into our social networking world to abide by these rules. Research has found that 25 to 44 year olds are the most likely culprits and there has been a 50% increase in those checking social networking sites whilst driving in the last year. In 2011 the Licence Bureau discovered that on average 1 in every 300 licences were invalid. They estimated that there are 24,000 people driving illegally for companies in the UK. 43% of these hadn’t even taken their driving test and were on provisional licences, 31% were on a revoked licence and 9% were even disqualified. A sandwich or half a pint? You’ll be better off if you pick the half a pint, as recent studies have shown that reaction times of drivers slowed by 12.5 per cent if they where at the legal alcohol limit. However if you decide to eat behind the wheel your reaction time could slow down by upto 44% research has shown. Although eating and drinking (soft drinks of course) whilst driving are not illegal, driving irresponsibly due to these actions can result in police charges. Do you have a company fleet driving policy that makes it clear what is allowed and what isn’t? 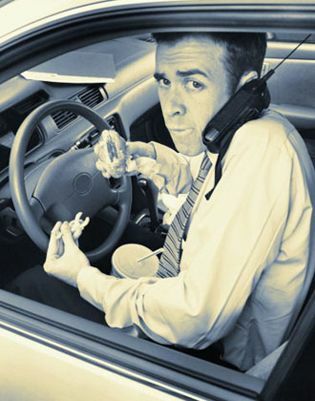 Distractions whilst driving - Do back seat drivers effect any of your company car drivers? Cannabis Cars of the future - Would you drive a coffee-powered cannabis company car?